Car Chat General discussion about Lexus, other auto manufacturers and automotive news. I haven't gotten many requests for retro-reviews (just a few here and there, for cars from my past)...but I thought I'd do one on the car that I first learned to drive on. Tell me what you all think...if you like them, I can do more of them. If you don't, or think it's a waste of time, equally fine, and I'll just keep concentrating on what I've been doing with the new vehicles. One major difference, of course, between reviewing a new vehicle and one from your distant past is that, in most cases, the old one has to be done pretty much from memory (with some research, if needed). Fortunately, with my lifelong interest for test-driving and sampling cars, even dating back to my teen years, I have a very sharp memory of the cars of that era, how they drove, and my early driving experiences. A Retro-Review of the 1963 Plymouth Valiant V-100. IN A NUTSHELL: Crude, noisy, and firm-riding for the period, relatively good handling, good gas mileage, and an indestructible drivetrain. By the late 1950s, the ever-growing, longer/lower/wider dimensions of most Detroit-produced cars, together with ever-larger engines, power-ratings, poorer gas mileage, and the sheer bulk of maneuvering and parking these monsters, particularly in tight city conditions, led to a growing consumer desire for smaller, more efficient, easier-to-manuver vehicles. There were a few American-sourced samples available, such as the Ramblers and the Nash Metropolitan, but it was the growing popularity of the rear-engined, air-cooled VW Beetle that, despite its quirks in its swing-axle handling, heat/defrost, and crash-protection, finally convinced the Big Three Detroit automakers that there was a credible market in the U.S. for compact cars. By 1960/61, the Ford Falcon, Chevrolet Corvair, and Plymouth Valiant/Dodge Lancer. The Falcon was thoroughly conventional in design for the period, (Body-on-Frame, Front-Engine/RWD), where the Valiant and Lancer twins used a conventional drivetrain and, like other Chrysler products, a unibody structure. The Corvair, for the period, was thoroughly unconventional....essentially a somewhat larger, American adaptation of the air-cooled, rear-engined VW Beetle and its unibody frame. The Corvair, unfortunately, also shared the Beetle's flaky heat/defrost system, rear swing-axle design, and its squirrelly, sometimes dangerous handling...subjects that Consumer Activist Ralph Nader panned in his famous book "Unsafe at Any Speed", which is part of my own automotive library. Public experience with the Corvair was so bad (and its image so poor) that, within just a year or two, Chevy had to rush through another new compact design alongside the Corvair.....the Chevy II (Nova). The Nova played it safe....it was just like the Falcon, throughly conventional, and avoided most of the Corvair's problems. Studebaker/Packard, a smaller company, also introduced the compact Lark. The Lark, like the Falcon, was throughly conventional in design, but also became the first domestic compact, a few years later, to introduce front disc brakes. In the end, though, the Lark proved unsuccessful, and, along with its parent corporation, sank in 1966. Anyhow, to the subject at hand.....the 1963 Valiant. It was, of course, along with the Dodge Lancer (which changed its name to Dart with the 1963 redesign) Chrysler's entry into the then-new compact field. As aforementioned, it used a conventional drivetrain with a (then unconventional) unibody frame/chassis. Unlike the others and their coil-spring suspensions, it also used different underpinnings....longitudinal torsion-bar front suspension and, like pickup trucks, leaf-springs in the rear. This gave it better handling and load-carrying capability (which I'll go into more later)...but also a firmer, noisier ride. My late father, at that time, was addicted to Chrysler products...and, until the day he passed from cancer in 1988, never outgrew his love for (and his ownership of) the 1960's-vintage Valiant/Barracuda and their Slant-Six and small V8 engines. I myself, even as a young teen, liked the ride and quietness of Ford and GM products more, but he was sold on Chrysler products of the period. He had previously had a full-size 1961 Dodge Dart Pioneer, which he bought brand-new and kept for 6 or 7 years. So, one day in late 1967 or early 1968 (I don't remember exactly the day) he went out and came back with a used, mint-green 1963 Valiant 2-door sedan for my Mom, to do her errands with every day. It had the optional 225 cubic-inch (3.7L) Slant-Six engine (a 170-cubic-inch was standard), a three-speed Torqueflite transmission for easier stop-and-go driving (my poor Mom was not one to enjoy rowing her own gears in traffic), an optional heater, and little else.....it was essentially military-stark compared to today's cars. And that's the car that I, the eldest son in the family, learned to drive on. Meanwhile, my late Mom's more elderly cousins and her retired husband, has gotten a new 1967 Cadillac Sedan de Ville, and sold their old 1962 Sedan de Ville to my Dad at a good (family) price to my Dad, and, for a couple of years, that remained our long-distance car...the one my Dad drove to work until he went to work at Philco-Ford and got company cars. The Slant-Six engine was as tough as nails......until high-quality Toyotas and Hondas became popular in the late 1970s and early 1980s, arguably the most durable gas engine in the American market. Its durability is proven in that, for years, along with the Checker Marathon and its Chevy Stovebolt-Six engine, it was one of the most poplar taxicab engines in the country. It was first developed as a military engine in Dodge trucks (one reason for its durability), and a few early samples were done with a then-unusual aluminum block, which soon switched to cast-iron. In those days, the average American car engine had a lifetime of maybe 80-90K miles (sometimes 100K if well-serviced) with ring/valve-wear and oil-consumption typically starting to increase around 70K or so....Slant-Sixes often went twice that distance, and some of them are still running today. So.....what was it like to drive that old workhorse? Read on. DRIVETRAIN: RWD, Longitidinally-Mounted 3.7L in-line six, 145 HP @ ? RPM, Torque, ? Ft-lbs. @ ? RPM, 3-speed Torqueflite automatic transmission with push-button operation. EPA MILEAGE RATING: EPA ratings did not exist back then. INTERIOR: Light Green Vinyl with gray/black three-tone effect. Single-barrel carburator less balky than on two-barrel Chrysler products. Good handling for an American-designed car of the era. 5/50 Drivetrain warranty a first for American cars. Baked enamel paint finish more durable than GM's acrylic lacquer (but not as good as Ford's). Good trunk space for a car in that class. Push-button transmission PRNDL sequence more foolproof than GM's PNDLR lever. Typical Push-and-Pray Chrysler non-power drum brakes faded very quickly. Torsion-bar/leaf-suspension and unibody structure transmitted high levels of road/wind/tire noise. Virtually military-stark interior and dash. Almost no safety equipment compared to modern vehicles. Poor winter traction from front-engine/RWD (snow tires only helped a little). Required much more maintenance than modern cars. Small rear taillights hard to see....and no third-light at eye-level. Lacked windshield washers and intermittent wipers for bad weather. The First-Generation 1961 and 1962 Valiants and Dodge Lancers were somewhat oddly-styled (as a number of American-designed cars were during that era), and did not sell particularly well, so, for 1963, the designers completely redesigned the exterior and interior, making it much simpler-looking, somewhat more along the lines of Ford's very successful Falcon and Chevy's just-introduced Chevy II/Nova. The Plymouth version kept the name Valiant,and the Dodge was renamed from Lancer to Dart. and The 1963 models were significantly more successful than their predecessors, and the same general body styles (sedan, wagon, convertible) were kept in production several years, until a 1967 redesign (the 1968 Valiant, in that 3rd generation series, was my favorite of the whole Valiant-sedan history, and my Dad later owned one of those, too, with a three-on-the-tree manual transmission, but that is a subject for another review). The 1963 traded the 1961/1962's dual-quad headlights for single-beams, got rid of the slanted-fins by the trunk, got rid of the imitation spare-tire outline on the trunk-lid, and, overall, introduced a much cleaner look, though the interior, even by compact-car standards of the time, was almost military-stark. The tiny 13-inch wheels and tires looked almost like doughnuts compared to today's cars, and, even by the standards of the time, housed inadequate brakes that faded much too quickly...Consumer Reports, at the time, rated the brakes Fair-to-Poor, but more on that later. I remember, on my sample car, the single, somewhat flimsy trunk-lid latch was iffy, and one had to really slam the lid down with some force to get it to stay latched and not pop open. The simple windshield wipers were on and off....that's it. Just one speed, no intermittent feature, no washers, and no Low/High adjustment. The fuel-filler pipe was one of the worst exterior features. It was behind a body-color twist-off cap, on the drivers' side rear fender, and the horizontal nature of part of the pipe allowed gas to back up, against gravity, as it was being filled, and sometimes spit back out the hole....yes, onto your hand, fingers, shirt-sleeve, and paint on the fender. Valiants and Darts could often be identified by the stains on the fender below the filler-cap. I probably need not state the obvious....but the body sheet metal, like most American cars of the period, was like a tank compared to the tin-can stuff they are using today, that you can push in and buckle with one finger. Open the hood (it had only a one-stage latch, above the grille, as dual-latch hoods were not required until the late 1960s), and, underneath, there was no hood-insulation pad (and it showed in the noise-level...more on that later). Once nice touch, though.....no manual prop-rod like on Ford's Falcon, as heavy-duty springs (not gas struts) were built into each side of the hood to help hold it up. Underneath, there was plenty of room for the in-line Slant Six, longitudinally-mounted, to fit in, as the compartment had also been designed to accommodate a small V8, which later versions got as an option. The engine block of the six was tilted over to one side, at roughly a thirty-degree angle, hence the name "Slant-Six"...that helped allow for a somewhat lower hood-line than with more upright engines. The distinctive curved/arc design of the intake manifolds, one to to each cylinder, gave it the nickname "Bunch of Bananas". Engine cover? Hah....what's that?...they were unheard of in those days, and that, along with stark-simple underhood wiring/plumbing and hardware, made cars like this a Shade-Tree mechanic's dream. Just open the hood, do what you need to, and close it again....very simple. Welcome to the U.S. Army.......with a couple of exceptions, that's about the best way to describe entry-level, compact-car interiors of that era, and the Valiant's, for sheer starkness, was one of the worst. Headroom was fine for me and my tall teenage-friends, even in the rear seat, but that's about it. The interior door-panels were painted bare-metal light green, with a thin vinyl sheet over the central part. Safety-levels in the interior were appalling by today's standards. I don't remember (though my memory is not totally clear here) if it even had seat belts or not (our later 1968 Valiant did). But the dash was solid sheet-steel all the way across (no padding of any kind), there were thick, hard chrome-metal door-latches and window-cranks sticking out right next to your ribs in every seat, the thin, hard-plastic-rim for the steering wheel (with finger-indentations) had no give or padding of any kind, and the sun-visors were essentially a couple pieces of cardboard. The thinly-padded bench seats had a vinyl covering in light-green/gray/black. There was no standard radio (we had installed a simple, on/off, manually-tuned AM radio installed at a local auto shop), a pull/twist **** under the dash for the heater and single fan-speed, a plastic dash/gauge pod with the speedometer/fuel-gauge/temperature gauge mounted not he hard-steel dash, a pull-**** for the headlights/parking lights, and the PRNDL transmission push-buttons (with a separate PARK-position lever) mounted vertically to the left of the wheel, a cigarette lighter, and that's about it....welcome to the world of simplicity. I've already described the Slam-O-Matic trunk-latch, with its cantankerous lock, so I won't go into that again here. The truck is decently-sized for a domestic compact sedan of that era, though very crudely lined....there was nothing but a piece of plaid-gray vinyl sheeting covering the hard floor, and nothing but light-green-painted bare metal on the walls (the car's outer-fenders) with no insulation of any kind....another factor in the car's high noise level. Part of the aforementioned horizontal gas-filler-pipe ran through the trunk, exposed, and then turned down to the fuel tank. At least there was a REAL spare tire and wheel inside the trunk (and I once had reason to use it)......not the Temporary, Donut, run-flat, or compressed-air bottles we see today. The one redeeming feature of this car, as mentioned before, was its drivetrain. Not only was the Slant Six economical, peppy by the standards of the time, and could really stretch a gallon of gas compared to most engines (even other sixes), but its reputation for durability was legendary. Its single-barrel carburetor, as I recall, was much less fussy than the notoriously poor two-barrels used on Chrysler-built V8s of the era, which stalled/hesitated and iced-up in cold/wet conditions and warmup. The starter, however, made the distinctive Chrysler high-pitched whine, and occasionally the engine partly flooded on a hot start (not as bad as with the two-barrels), and required several seconds of cranking to clear it. But the butterfly valve never stuck open or closed like with the Carter-built two-barrels, and the fast-idle cams usually worked properly. 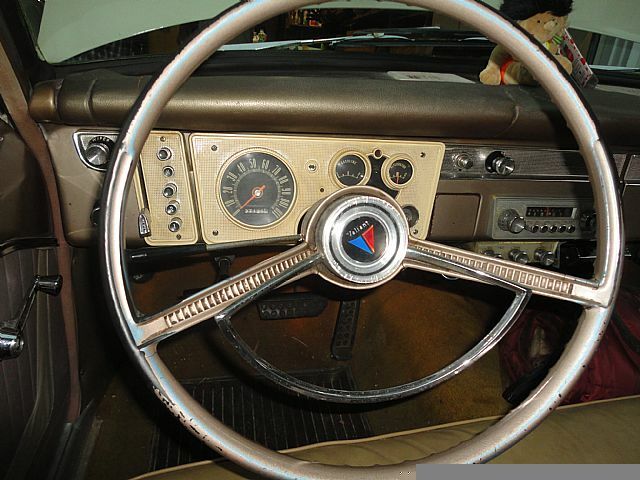 Valiants and Darts of that period came with the rugged three-speed Torqueflite automatic transmission, not a two-speed like the Ford-O-Matic on the Falcon and two-speed Powerglide on the heavy Nova (which, IMO, did more gliding than powering LOL). The Torqueflite's minus side was that it was noisy and firm-shifting, lacking the refinement and smoothness of some of its rivals....putting it in reverse, as it aged, could result in a jolt. Road noise and wind noise were simply unacceptable by modern standards, and even by some of the standards of the era...a result of the torsion/leaf suspension and unibody design of that era to transmit note and vibration like a telephone line...again, Ford and GM products, wth their coil springs and body-on-frame designs, were noticeably quieter and smoother. Wind noise was worsened by the lack of insulation or effective weatherstripping. Handling, however, was a notch above the coil-spring BOF vehicles, as the firmer torsion bars/leaf springs and more solid unibody structure was stiffer and more efficient at steering response. The steering system itself, though (manual/non-power), was just like most other manual recirculating-ball systems, and had noticeably slower response than later rack-and-pinion, and the typical free-play across the middle that increased as the system wore and aged. The worst feature, though, on the road, was the brakes. The small manual-drums (no power assist) were best described as Push-and Pray after they got some heat and started to fade....much more quickly than with even other drum brakes from other manufacturers. The first applications were usually reasonably OK, but, if you had repeat applications, and didn't give the braked time to cool back off, you were rewarded with more and more pedal-effort for less and less effectiveness....not a comforting feature on steep hills, where the three-speed transmission at least gave you an extra lower gear for engine-braking that the two-speeds in the other cars lacked. Weak manual-drum brakes, BTW, were a problem not only on Valiants/Darts, but a number of lower-level Chrysler products that lacked discs or power-assist. Occasionally, Ford and GM manual-drum brakes could also have fade-problems, but not as severe as the ones on Chrysler products. Many drum brakes of the period also lacked self-adjusters, so they had to be manually-adjusted to compensate for lining/drum wear with mile. And, of course, ALL drum brakes, regardless of make, could lose their effectiveness if they got wet....you had to pump and pump them to heat them back up and evaporate the moisture off the linings, restoring their effectiveness. While the Valiant and Dodge Dart were not exactly the epitome of refinement, they quickly won a devoted and rather widespread following (including my late father) for their reliability, drivetrain durability, and economy of operation....characteristics which the taxi companies also liked, though they usually used the Slant-Six in the larger Plymouth Belvedere/Dodge Coronet for more passenger space and better comfort. I'll always remember them as the first cars I learned to drive both an automatic and column-stick in........though the manual three-on-the-tree lacked synchronization for first gear, which meant you had to come to a stop to prevent gear-crunching. I drove Valiants all over the Mid-Atlantic region, and occasionally west across the mountains to see my relatives in Ohio. In fact, my Dad, as a high-schoolgraduation present, gave me a Valiant-offshoot (Plymouth Barracuda) as the first car I actually owned...used, of course, not new. It was reliable except for rapid brake-wear (Chrysler's lousy drum brakes, again), oil consumption from worn rings (it had the V8, not the more durable Slant-Six), and hesitation from the two-barrel carb. The Valiant and Dart soldiered on until 1976, when they were replaced, in the fall of that year, by the more refined and quieter Volare/Aspen..but the Aspen and Volare turned out to be quality-disasters. That, though, is the subject for another review (my Mom owned a Volare for a couple of years), not this one. Last edited by mmarshall; 02-05-19 at 05:09 PM. Never thought you'd be reviewing something like this. Damn the car is so simple but the total lack of any safety features makes me cringe. I "reviewed" it for almost two years, while it was in the family, before it was replaced by the later (and much nicer) 1-year-old 1968 Valiant. Of course, today, I have to describe it mostly from memory and images. No, the interior and level of safety-features did not inspire confidence, but, on the other hand, back then, traffic and population in the D.C. area was maybe one-fourth or one-third of what it is today, which vastly reduced the chances of having an accident to start with. Without much of today's development and construction, roads in the region were also a lot more scenic, picturesque, relaxing, and enjoyable to drive on......and they were in far better physical condition. Our infrastructure has gone to hell in a hand basket. Last edited by mmarshall; 02-05-19 at 06:16 PM. Those were the days. I can't wait to get my '64 Biscayne back on the road. Great. I remember the OP thread you posted. Give us another write-up on it when you get it running.....I'm sure you will. The Impala, back then an upmarket version of the Biscayne (although it was heavier, and generally didn't handle as well as the Biscayne because of the extra weight) was arguably the top-selling vehicle in the country. In one year in the mid-1960s (don't remember exactly which one) it sold over a million units. The SS, the classic sport-oriented version of it (particularly with the 409 and 427/4-speed), was THE full-sized muscle-car of the era until the 426 Hemi debuted at Dodge and Plymouth. Last edited by mmarshall; 02-06-19 at 05:59 PM. I thought the acceleration delete option qualified as a safety option! My Mom's stepfather had 2 or 3 of these over the years. His had a 3 on the tree shifter, 1st manual trans car I had been in. Marshall, what happened to the old car thread where this thread would have been? btw what was the displacement of slant 6's, were they all 225's?.......my buddy who gave me the 1970 Pontiac LeMans Sport for free, he got a 1981 Dodge Diplomat from his folks for free, which is why he gave me the Pontiac for free. Nice to get free cars from parents lol well 10 year old ones as that all transpired in 1991....from that car he went all the way to a 2000 Nissan sentra! Like a time warp. Also, his friend belonged to the slant 6 club of America and was a blacksmith on Long Island. memories! We've actually had a couple of them over the years, though I couldn't find them, even after a reasonable search. They were set up, though, more for general old-car chat than for specific reviews. In general, on Car Chat, most of the members are not really geared towards older-car talk....though I stick in an occasional old-car review just for the few that are. The Mopar (Dodge/Plymouth) 3-on-the-tree, in the 1960s, was especially tricky, since the linkage was so sloppy and first gear in the transmission was not synchronized. You had to come to a virtual complete stop before dropping the lever into first, even with the clutch pedal depressed. Care also had to be taken in the 2-3 shift, as you had do so it slowly or you'd outpace the 2-3 synchro and get some slight grinding. I don't understand why Chrysler took so long to use synchro on all their MT gears...Ford had fully-synchronized the competing Falcon's 3-speed box back in the early 60s. A friend of mind had a new 1970 AMC Hornet (another Valiant competitor), with a similar straight-six engine and three-on-the tree....compared to the Chrysler three-on-the-tree, the shift-linkage and action was like silk. His parents had given it to him in his senior year just as an economical run-around machine. Perhaps Chrysler neglected the MT linkage because the tough-as-nails Torqueflite automatic was so successful.....the vast majority of buyers, of course chose it. No. For several years, on the Valiant/Dart, the standard Slant Six was the 170 c.i. (2.8L), and the upgrade was the 225 c.i. (3.7L). Later, the 170 was dropped. A small 273 c.i. (4.5L) V8 was also available, but it was more popular on the sport-oriented Barracuda than Valiant (the Barracuda, before 1967, was a Valiant derivative). Larger mid-size (and even some full-size) Chrysler products had the 225 standard......the 170 was just too small for them. When the Volare and Aspen came out in 1976-77, the 225 was offered in both single barrel and a "Super-Six" twin-barrel carb. Chrysler offered the double-carb to add power and to address drivability problems on the emission-controled single-carbs. 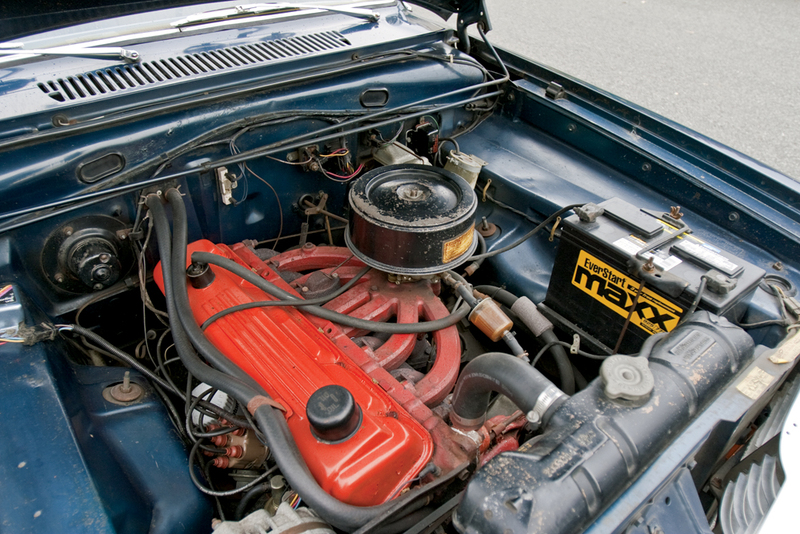 Some historians have considered the Slant Six the most durable automotive engine ever built. I won't go that far, as some well-made diesels from Mercedes and Peugeot might outlast it.....and some Toyota and Honda engines can go 300K or more miles before giving up. But there is little question that the Slant Six set the durability standard for its day....its average life, even with minimal maintenance, was often twice that of other engines of the period. my buddy who gave me the 1970 Pontiac LeMans Sport for free, he got a 1981 Dodge Diplomat from his folks for free, which is why he gave me the Pontiac for free. Nice to get free cars from parents lol well 10 year old ones as that all transpired in 1991....from that car he went all the way to a 2000 Nissan sentra! Like a time warp. Also, his friend belonged to the slant 6 club of America and was a blacksmith on Long Island. memories! I really liked the 1970 Pontiac intermediates, BTW.....including your LeMans Sport. Two of my neighbors had 1970 GTOs....which, of course, had more engine, the twin-scoops on the hood, and the Endura vinyl/rubber front-end. But the LeMans Sport itself was plenty nice enough, had the same nice interior of the GTO, and, considering that I wasn't a big power-freak, IMO, most of the time, was, at least by my standards, just as much fun to drive. Last edited by mmarshall; 02-10-19 at 04:03 PM. All times are GMT -7. The time now is 11:09 PM.